A total of 445 suppliers(1) are involved in the manufacture of Moncler’s products. They are grouped into four macro-categories: raw materials, façon, finished products, and services. • Raw material suppliers mainly provide fabrics, yarns, down, leathers, accessory components (buttons, zips, ribbons, elastics, etc. ), and furs. Fabrics are sourced primarily from Japan and Italy. Suppliers of yarns and accessory components are mainly Italian. Furs are sourced primarily in Europe and North America, while down is purchased from European, North American and Asian suppliers. • Façon manufacturers are specialist garment manufacturers with a high level of technical skill, who Moncler supplies with raw materials and entrusts with the manufacture of its final products. The production process is carefully monitored by Moncler technicians, who verify compliance with required standards through a strict methodology and regular on-site inspections. This process applies in particular to jackets, trousers, skirts, dresses, all knitwear, and some adult cut-and-sew products. Most of these suppliers are located in Eastern Europe, where a long manufacturing tradition guarantees a high level of technical expertise and suitable production capacity. 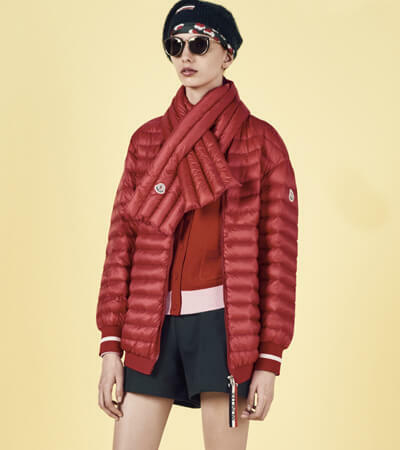 In 2018, the new business model introduced by the Moncler Genius collections led the Company to find new suppliers, particularly in Italy, with strong skills in particularly specific and complex processes. • Finished product suppliers manufacture products on behalf of Moncler based on the technical designs received, sourcing the raw materials themselves as per Moncler standards, with the exception of strategic materials such as down, nylon, and logoed materials, which are provided directly by the Company. These suppliers and Moncler’s experts interact at all stages of the manufacturing process, which is carefully supervised by the latter to ensure final products meet the high quality standards required. Part of the cut-and-sew products (especially T-shirts and polo shirts), part of the soft accessories, such as hats and scarves, gloves, footwear, handbags, and small leather goods are mainly produced through these suppliers. Cut-and-sew product suppliers are vertically integrated and are located in Europe and in Turkey. Soft accessories suppliers (hats, gloves and scarves) are mostly Turkish and Italian and have a high level of specific skill, while footwear and handbags are produced by European suppliers, most of whom are Italian. • Service suppliers assist Moncler in pattern making and quality control processes and are mainly located near the Company. From 2018, several of these activities, including in particular quality control, have been consolidated at Moncler’s hub in Piacenza to guarantee even greater efficiency in terms of time to market and hence customer service. Where possible, the Group avails itself of local suppliers situated near its main offices, which streamlines logistics and generates income and jobs within the local communities in which the Company operates. The majority of Moncler’s suppliers (90%) are located(3) in the EMEA, primarily in Italy. Moncler diversifies its purchasing expenditure across a number of partners so as to avoid dependency on any given supplier, which would pose a potential business risk. The Company’s top 50 suppliers account for about 70% of the total value of orders. The Group is careful to promptly identify any critical situations with the potential to cause supply disruption, addressing them accordingly to mitigate risk. In 2018, harnessing the momentum of the Moncler Genius project, Moncler launched an important model innovation and development effort linked to its collections, spanning creation, presentation and delivery. This change required rethinking the way in which the various corporate functions manage the growing complexity arising from the many designers involved, the launch of monthly collections, and the related management of time-to-market, as well as the development of new products that require new manufacturing processes. In this context, a development and innovation programme for the Operations & Supply Chain department was launched in 2018. The programme, called Supply Chain Excellence, aims to take the supply chain to an even higher level of excellence by developing the operational and industrial area according to an advanced and functional model capable of mastering the constant evolution of the market. processes, as well as integration between people belonging to the different departments involved. The critical success factors existing today and the ones necessary for the future have been analysed and specific projects have been launched. They all share the objective of achieving operational excellence in terms of quality, speed, sustainability, reliability, flexibility and efficiency. Product quality, at all stages of the process, from design to delivery, is the focus of all activities, as well as shorter lead time and greater precision and punctuality in delivery. In particular, the time taken to cross the supply chain was analysed with the aim of reducing the time needed from product launch to production and delivery. This work has also involved an effort to fine-tune and improve the information sharing process and the planning of timing to ensure punctuality on the market. Particular attention was also paid to the sizing and development of the supply chain in line with the Company’s strategic vision. All the initiatives developed have been supported by innovative IT tools to support the business to ensure better responsiveness and coordination of all business areas involved. 1 Excluding prototype and pattern making suppliers, and suppliers with sales orders of less than 1,000 euros a year. 2 Percentage calculated on the total number of suppliers. 3 For façon manufacturers and finished product suppliers, the geographic location corresponds to the country the product was ‘Made in’; for service and raw material suppliers, it corresponds to the country in which the supplier’s head office is registered. Percentages calculated on the total number of suppliers.